Special Containment Procedures: A security camera has been mounted near the transplantation site; footage should be reviewed for changes on a weekly basis. Hardhats are mandatory for those working in close proximity to SCP-1180. All instances of fallen or new growths should be promptly reported to the head of Botanical Research. Description: SCP-1180 is identical in appearance to Cocos nucifera, the coconut palm. The anomaly was discovered when a research team was dispatched to investigate local rumors of a "possessed palm": witnesses claimed that the plant would intentionally drop its sizable drupes on the heads of unsuspecting passersby. The specimen was found growing in relative isolation on a strip of shore less than 16km from the outer perimeter of Research Sector-09. 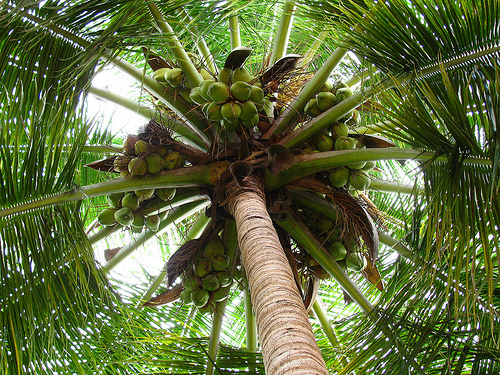 SCP-1180 grows and fruits at the same rate as a comparable specimen of Cocos nucifera. The organism's only outwardly anomalous trait is a rattling or knocking sound that emanates from its fruits. These noises grow louder as the drupes reach maturity. Radiography results are identical to those of normal coconuts. Tests with human subjects suggest that the organism is equipped with an unusual adaption for preservation and propagation; while the tree itself is vulnerable to damage, subjects instructed to open, crack, or otherwise damage its offspring experience significant emotional distress. Research team, equipped with suitable headgear, meets with no accidents while examining the organism. A subdued rattling, described by recovery team as "knocking sounds", can be heard issuing from inside the ripening coconuts. Excavated root ball densely packed with worms of an unknown species. Several days of observation have yielded similar results; decision made to transplant the palm to Sector-09 grounds for further tests. Transplant accomplished without mishap. Synopsis: Subjects are provided with tools and instructed to remove the husk of a coconut (designated SCP-1180-01) recently cut from SCP-1180. Majority visibly distressed by the knocking sounds from within. Several describe a feeling of horror; a few describe empathetic feelings— always with the desire to remove the object "outside". During sixth consecutive test, D-3767 (a subject with exceptionally low empathy scores) finally succeeds in rupturing and peeling away the husk; no immediate adverse effects observed. After removing husk, subject seems reluctant to crack open the shell. The rattling has grown perceivably louder, sometimes slowing almost to a stop before beginning again with renewed violence. The subject claims to "feel" the vibrations of the knocking, and claims that SCP-1180-3 has a "face". Subject refuses to remain in the same room with the object; eventually subdued and removed for observation. Other subjects are instructed to photograph and describe their reactions to de-husked specimen; all react with similar displays of reluctance and increasing uneasiness. D-8084, another subject with significantly low empathy scores, instructed to crack open the already de-husked SCP-1180-3. Suitable precautions are taken by observing research team. Using a hammer, D-8084 manages to split the fruit open, cracking it into several large pieces. The white "meat" appears slightly rotten; kernel is otherwise empty. New growths have appeared on SCP-1180, apparently in place of those removed for testing. None of these specimens have been observed to "rattle". D-8084's body discovered standing rigidly upright in the center of his cell. The corpse had been decapitated; site of injury is wrinkled and puckered, cause of trauma undetermined. Head of D-8084 not yet recovered. The largest instance of the new growths, designated SCP-1180-8, now measures 110mm in diameter. Caretakers have reported knocking sounds coming from inside the husk.